usb c to 3.0 usb adapter: The USB port hub including 1 Ethernet port, 1 Type C cable and 3×USB 3.0 ports support hot plug that for matching phone, keyboards and other peripherals, Enjoying the data transfer rates of up to 5Gbps for faster sync times. Access and transfer data more efficiently. 3-port usb 3.0 hub: Plug and play with no external drivers or power required, easily add 3 USB 3.0 super speed ports to your PC. USB-C Compatible: Works with the latest computers, Windows (Vista / XP/ 7/ 8/ 10) and smart devices with USB-C ports. Automatically adapt to 10M/100M Mbps network transmission. 1 years warranty and friendly customer service. 1 to 4 Instant Expansion: USB-C Hub with 3 x 5Gbps USB 3.0 Ports,1x 10/100M Ethernet Port(RJ-45). USB C To Ethernet + 3XUSB 3.0(Super Speed) Adapter. 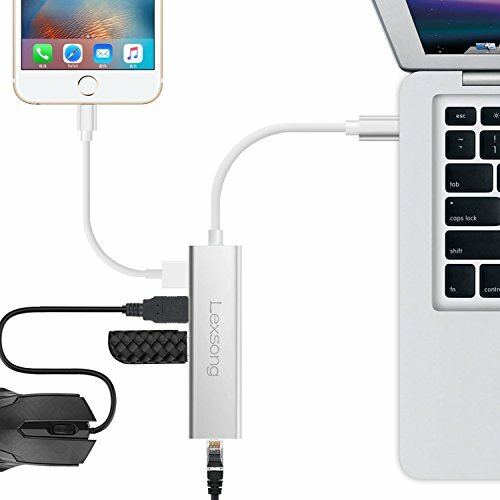 Compatible with the new usb c laptops, such as new macbook 2015/2016, macbook pro 2016, dell xps 13, hp spetre X2, hp spetre 360, chromebook pixel, or other devices with usb-c ports. Fully Functional USB 3.0 and Supper Speed: Macbook usb adapter has three fully functional USB 3.0 Ports which could provide data transmission speed up to 5Gbps, but USB 2.0 Technology can provide up to 480M/1s. All the three USB 3.0 ports compatible with USB 1.0,1. 5, USB 2.0, and USB 3.0 devices. If you have any questions about this product by Lexsong, contact us by completing and submitting the form below. If you are looking for a specif part number, please include it with your message.